LIKE A LOST TRIBE looking for a way out of the wilderness, these people are following a leader they hope will guide them to safety. Andrew Gilligan, of the Greater London Authority, left in the red jersey, above, was giving them an exclusive preview of CS1, the cycle superhighway planned to run north from the City through Hackney and Islington to Tottenham. 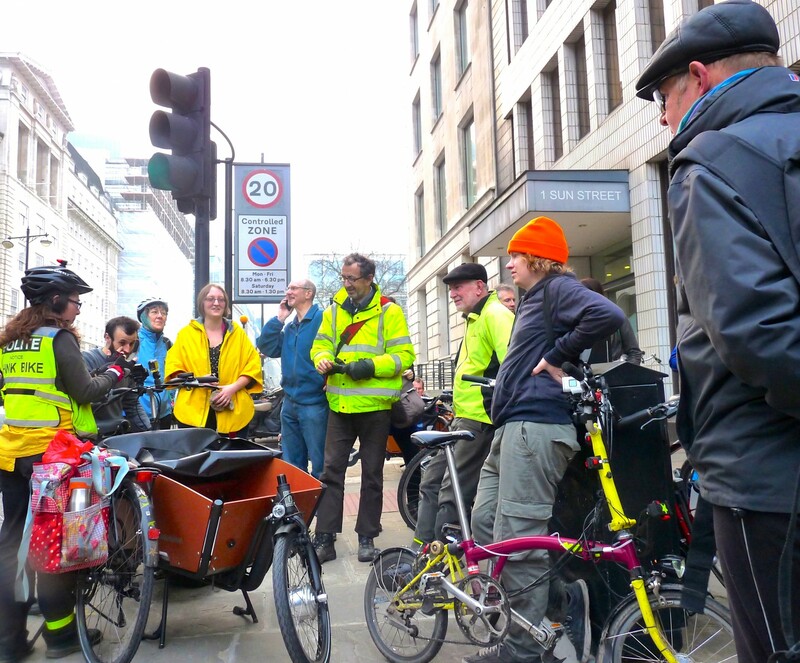 The cycling commissioner met the recently formed group Hackney People on Bikes earlier this winter and volunteered the sneak preview of CS1. Just under 30 people, including two toddlers and cycling councillor Feryal Demirci, rode up to the start in Sun Street, City. Some of them liked parts of the route, others would prefer dedicated lanes to be built on theKingsland Road/A10. They can make their views known in the consultation, which ends on 29 March 2015.